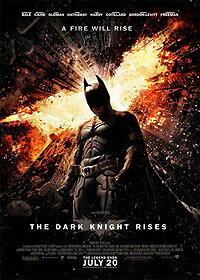 A new evil rises in Gotham city, forcing the Batman to return and sacrifice it all. The thrilling conclusion to the Christopher Nolan Dark Knight trilogy. Bane:"I will show you where I have made my home while preparing to bring justice. Then I will break you." Selina / Catwoman:"My mother warned me about getting into cars with strange men." Bruce Wayne / Batman:"This isn't a car." Bane:"Let's not stand on ceremony here." Commissioner Gordon:"Far out there when the structures fail you, and the rules aren't weapons anymore, they're shackles letting the bad guy get ahead. One day, you may face such a moment of crisis. And in that moment, I hope you have a friend like I did, to plunge their hands into the filth so that you can keep yours clean!" Bane:"Oh, you think darkness is your ally. But you merely adopted the dark. I was born in it, molded by it. I didn't see the light until I was already a man, by then it was nothing to me but blinding!" Bane:"Peace has cost you your strength. Victory has defeated you." Bruce Wayne / Batman:"Why didn't you just kill me?" Bane:"You don't fear death. You welcome it. Your punishment must be more severe." Bane:"Yes. But not of your body, of your soul." Bruce Wayne / Batman:"Where am I?" Bane:"Home, where I learned the truth about despair, as will you. There's a reason why this prison is the worst hell on earth. Hope. Every man who has rotted here over the centuries has looked up to the light and imagined climbing to freedom. So easy. So simple. And like shipwrecked men turning to sea water from uncontrollable thirst, many have died trying. I learned here that there can be no true despair without hope. So, as I terrorize Gotham, I will feed its people hope to poison their souls. I will let them believe they can survive so that you can watch them clamoring over each other to stay in the sun. You can watch me torture an entire city and when you have truly understood the depth of your failure, we will fulfill Ra's al Ghul's destiny. We will destroy Gotham and then, when it is done and Gotham is ashes, then you have my permission to die." Bane:"Calm down Doctor. Now is not the time for fear. That comes later." Bruce Wayne / Batman:"So that's what that feels like." Bane:"You fight like a younger man, with nothing held back. Admirable but mistaken." Bane: "Let the games begin!" Bane:"Do you feel in charge?" Bane:"Theatricality and deception. Powerful agents to the uninitiated. But we are initiated, aren't we Bruce." Alfred Pennyworth:"What are you doing?" Bruce Wayne / Batman:"Examining print dust. We've been robbed." Alfred Pennyworth:"And this is your idea of sounding the alarm is it?" Bruce Wayne / Batman:"She took the pearls, tracking device and all." Bruce Wayne / Batman:"One of the maids. Perhaps you should stop letting them in this side of the house." Alfred Pennyworth:"Perhaps you should start learning to make your own bed." John 'Robin' Blake:"I showed your picture to the Congressman. Guess what?" Selina / Catwoman:"Don't tell me. Still in love?" John 'Robin' Blake:"Oh head over heels. Pressing charges though." Bruce Wayne / Batman:"You've made a serious mistake." Bane:"Not as serious as yours, I fear." Alfred Pennyworth:"Is it really painful?" Bruce Wayne / Batman:"You're very welcome to try it Alfred." Alfred Pennyworth:"Happy watching, thank you sir." Selina / Catwoman:"The rich don't even go broke the same as the rest of us, huh." Commissioner Gordon:"Clear the corners rookie." Captain Jones:"I'll die before I talk." Bane:"I'm on your schedule Captain." Selina / Catwoman:"You think all this can last? There's a storm coming, Mr. Wayne. You and your friends better batten down the hatches, because when it hits, you're all gonna wonder how you ever thought you could live so large and leave so little for the rest of us." CIA Op: "Who are you?" Bane: "It doesn't matter who we are. What matters is our plan. No one cared who I was until I put on the mask." CIA Op: "If I pull that off, will you die?" Bane: "It will be extremely painful." CIA Op: "You're a big guy." Bane:"Go on then. Do your work."